This is a very small tool that can be used as a knife, a pry bar, bottle opener, scraper and nail remover, other uses are possible depending on your imagination. The MSOPT is about 3 inches long and it's made of S30V steel with a satin finish. As the picture shows the tool is really very small and cute. The blade is sharp and can be used to open boxes, cut wire and other jobs. The bottle opener works perfectly and the front of the tool can be used to pry, scrape, clean and remove nails. The only small detail to remember is not to put your thumb over the blade when you use the bottle opener, unless your thumb is very thick or the blade very dull but the blade comes very sharp from Peter's shop. The MSOPT comes with a cord handle, either rubber or paracord and it has a hole that can be used for a lanyard. They come with a kydex sheath that is setup for neck carry but can also be used in your keychain, in your backpack or dropped inside one of your pockets. 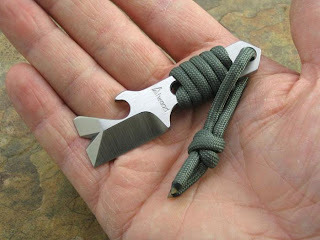 The blade being sharp means you need to store your MSOPT in the kydex sheath to carry it and while the tool is really small it is not so small with the sheath so it may be a little bulky for your keychain. In short words this is a very very nice and useful little tool that is not only beautiful and cute but also very strong and does many things very well. You can read more and order for $80 from Peter Atwood's website. These are spy/survival capsules with a shape similar to a scuba oxygen tank. They are wider than other capsules being 2'' long with a 3/4'' diameter. 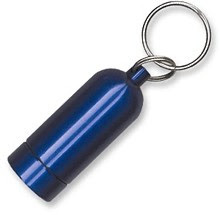 As other capsules this one can be used to store cash, pills, thread and other small items, they are very common for small items when geocaching; the wide body makes them useful for pills that won't fit other capsules and for other round items with a diameter as big as 3/4''. They are made of aluminium with a rubber o-ring for sealing, so they will be water proof and dunkable. The capsule wall is quite thick so impacts and falls won't damage the capsule and its contents. They are slightly bulky for a keyring but that depends on personal preferences. They come with a split ring and a couple of extra o-rings, if you are going to take them underwater using two o-rings instead of one might be a good idea for extra safety. If you think about using them as C123 battery holders please check some of the capsules fit a 123 battery and others don't due to minimal finishing details. One detail we liked is that since the capsule is opened near the bottom you can use almost all the volume of the capsule to store mini kits without anything dropping when you open it. You can order them in red, blue or gun metal silver for $5 each from this website. 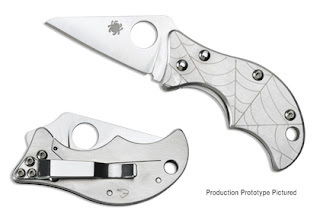 The spin is a very small keychain/EDC knife by Spyderco it measures 2 7/16'' (63mm) when closed and it has a 5/8'' (41mm) blade, the total length when opened being 4 1/8'' (105 mm). The total weight is 1.35oz (38gr). The blade is VG-10 steel with a wharncliff profile maximizing cutting surface for its size. The slightly rounded tip is good for precision cutting and can even work to clean small places or fingernails. The handle is stainless steel with a laser engraved spider web, grip is good due to the very ergonomic shape of the handle your fingers will be safe from the blade even if you have to put some pressure in the knife. The lock is called an Integral Lock. This is basically a Liner Lock with a twist created by Chris Reeve it uses the the handle scale as the lock’s liner in this way the back of the handle is used as the lock removing the need for internal liners and making the knife very very slim. The Spin comes with a stainless steel pocket clip that is used to clip the knife tip-down to your pockets and can also work as a money clip if you prefer to use it in that way. There is also a lanyard hole for a wrist lanyard or neck carrying. A very small knife with an excelent design, solid construction and a surprising ability to cut the spin is a great little knife with a low profile that won't scare anyone. It can look like a stylish accesory or money clip and be used as a serious cutting tool when needed. You can read more or order for $80 from Spyderco's website.